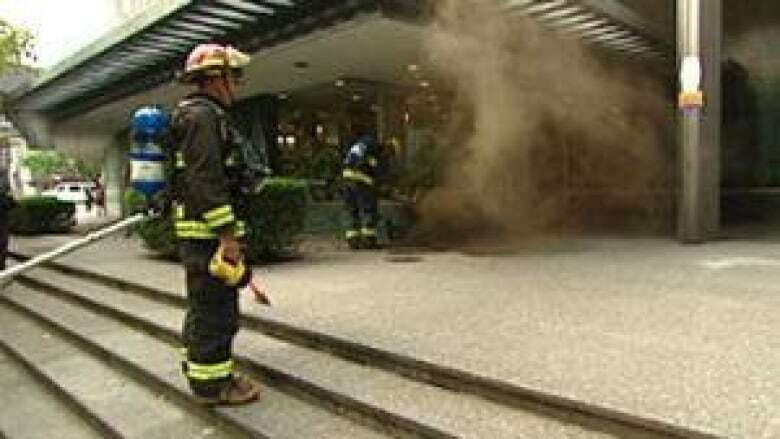 A chemical incident that shut down blocks of downtown Vancouver two years ago and saw hundreds of residents evacuated from the Electra building at Burrard and Nelson streets has resulted in a flurry of lawsuits. Emergency officials forced the evacuation of more than 240 residential units and 200 commercial units of the former BC Hydro building on Sept. 17, 2010 after noxious fumes and billowing smoke started pouring from the area where contractors were trying to raise a terrace by pumping in a combination of chemicals aimed at producing a high density polyurethane foam. The chemicals caught fire, raising fears of widespread contamination. Residents of the building weren't allowed back in their homes for nearly a week. In the past week, 10 lawsuits have been filed in B.C. Supreme and B.C. Provincial Court. The suits include claims against the contractor and the City of Vancouver from residential and commercial occupants of the building. True North Concrete Lifting, the contractor that did the work, is also suing the building's strata council and the U.S.-based companies that sold them the chemicals used to do the lifting. In the True North suit, the company directors claims Electra's strata council hired them to lift a portion of the building's exterior terrazzo stone-tiled concrete walkway. They claim the strata management assured them nothing lay beneath the walkway but sand and gravel fill. But when True North began pumping the chemicals beneath the sunken concrete, they claim they quickly discovered a large void. They say strata management gave them the go-ahead to keep pumping the chemicals into the void even though they had reached their allotted volume for the project. True North claims they phoned the owner of the American chemical supplier to express concerns about the large volume of product pumped beneath the walkway. According to the claim, the supplier said "now is when you start making money." In total, True North says 993 litres of the combined chemicals was pumped into the walkway. The next day, brown smoke started pouring into the Electra and a noxious odour enveloped the surrounding blocks. True North claims the U.S. supplier assured them the odour was 'typical' of 'off-gassing' and represented no danger. True North claims the incident and the associated negative publicity cost them their reputation, the loss of existing work and a significant reduction in new clients. They're claiming negligence against the chemical suppliers, Hydraulic Mudpumps and Raiserite Concrete Lifting. They also claim the strata council managers failed to warn them about the giant void beneath the walkway. A handful of the Electra's commercial and residential tenants are suing True North in B.C. Provincial Court for inconvenience, costs and loss of business suffered as a result of the evacuation. The limit for claims at that level is $25,000. But some residents have also filed suit in B.C. Supreme Court for a variety of ongoing injuries allegedly suffered as a result of exposure to the chemical fumes once they returned to the Electra. They claim to have suffered neurological injuries, cognitive deficits, dizziness and blurred vision, weakness and fatigue, depression and chronic pain. Those suits accuse True North and building management of failing to take steps to warn residents about the potentially dangerous nature of the work being done. They're also suing the City of Vancouver for allegedly failing to take adequate measures to ensure the building was in a reasonably safe condition before residents were allowed to reenter. They claim city employees were not adequately trained in emergency procedures when it comes to chemical fires. Victor Balzer, who is named in the suit as one of the directors of True North Concrete Lifting, said he had no comment on the suits when contacted by CBC News on Friday.